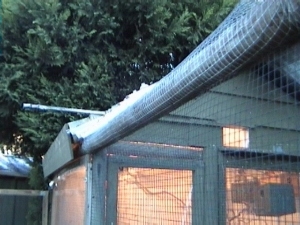 The aviary measures 1.6 metres wide, 4.7 metres long and 2.1 metres high and the frame is made of treated pine timber logs, approximately 75mm in diameter. The wire is thin gauged 12mm squares. The wire is painted each year with water based flat black paint which gives the wire more of an invisible appearance. The indoor section is 1.6 metres square with two inside walls of white colored ply board. Again this is cleaned and painted each year. The external wall and roof is made of pine boards (fence palings). 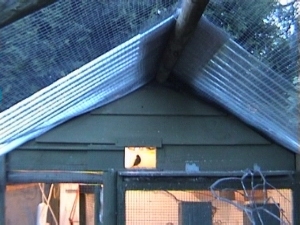 The walls are insulated and under the external wall and roof it is also lined with black plastic to stop any leaks. The floor is concreted and covered with washed beach sand. The sand is replaced when it becomes too soiled and dusty. There are large windows making up the other two walls, allowing plenty of natural light. The large front window is removable allowing the air to circulate on hot days, keeping out the draft on windy, rainy or cold days and nights. The weather can be very unpredictable in Melbourne with four seasons in one day and therefore the removable window comes in handy. To the left you can see the entry door. 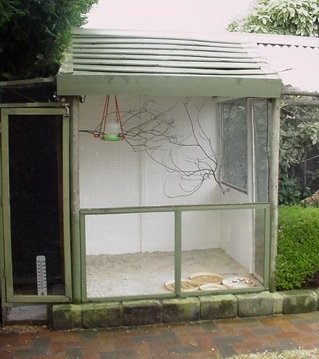 It is a double door so that the birds cannot escape when entering the aviary. 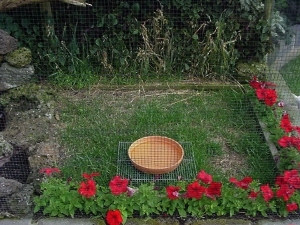 The outdoor area is accessed by another external so that I don't have to disturb the birds when I only want to enter the outdoor area. You can see a water bowl suspended from the ceiling in the front left corner of the indoor section. At the back are natural tree branches. 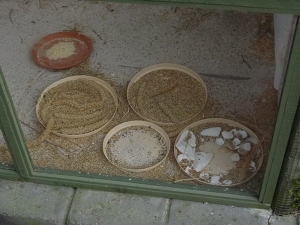 The perches are kept clear of the seed trays that are on the floor so as not to contaminate them with bird poop. The Gouldians love to flock feed so don't use seed hoppers! 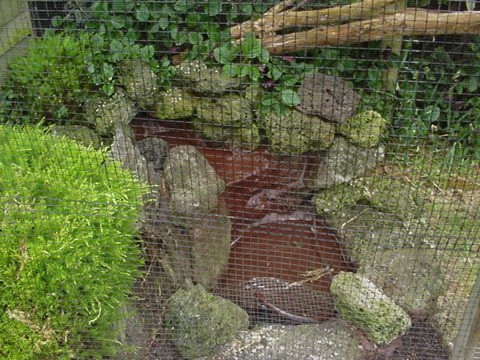 In the outdoor section I have built a waterfall and rock pond that operates using a small pump system. The pond holds approximately 16 litres of water. This is medicated with Vetafarm Aviclens which keeps the water sparkling clean reducing the growth of algae, fungi and yeast in the drinking water, otherwise it would be a health risk to the Gouldians. Please visit the Tips Page to see when and how I clean the pond. The Gouldians love to stand on the edge of the waterfall ledge and let the water rush over their feet. As you can see the Juveniles are quick to copy. It is also agreat way for them to keep their feet clean. Beside the rock pond there is a grass area where I throw seed as the finches loves to eat amongst the grass and dirt. I also grow their seed in a dirt bed at the foot of the back wire wall. They also love to eat from the green seed heads. I also plant various annuals to attract insect life. The finches love fossicking among the plants and I am sure it stimulates them. All perches within the aviary are natural tree or shrub branches collected from dead trees along the roadway. The various shapes and sizes keep the Gouldians happy and their feet properly exercised. 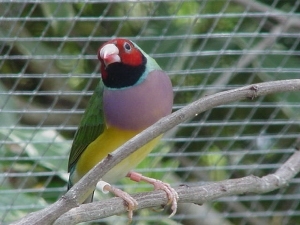 The Gouldians travel between both sections through a small opening approximately 16 cm by 12 cm. 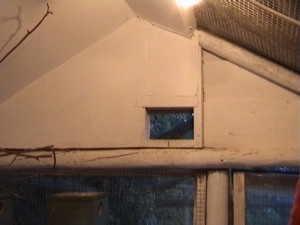 This opening can be opened and closed with a sliding door by operating a handle from outside the aviary. 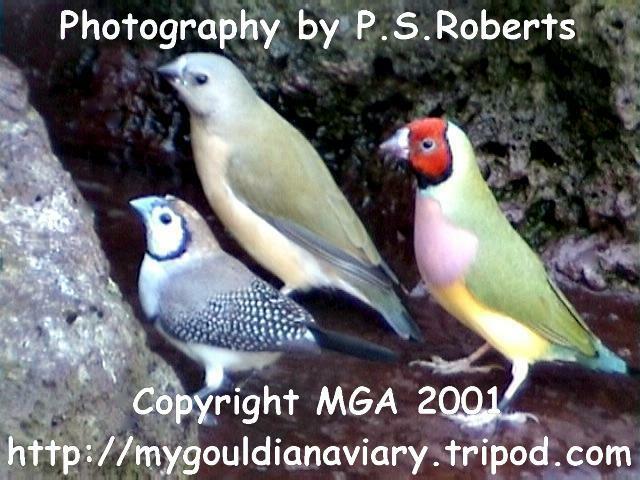 The Gouldians fly through this opening with amazing speed and agility. I lock the colony in the indoor section at night time and if the weather is unfavorable. There are two three foot fluorescent lights in the indoor section and two blue 40-watt light bulbs. These are only used during winter. Using automatic timers, the fluorescent lights turn on at 6am and turn off at 5 pm. The blue lights turn on at 4.30 pm and turn off at 6.30 am. The overlap at the end of the day helps the transition from daylight to twilight so the Gouldian's are not spooked. However, in winter when it gets dark early at about 5.20 pm, the Gouldian's naturally retire to their favourite roosting spot before nightfall anyway. The reason for using the lighting system is to lengthen the daytime so parents can feed their young ones in the nest. In addition, because there is no heating, the blue lights offer a little bit of warmth if the temperature was to drop below 4 C and at the same time they are dim enough, similar to a full moon, thereby simulating darkness, so as not to disturb the sleeping Gouldian's. On still nights the colony will roost outside, among the leaves of a small tree that grows through the wire. I try to discourage this if I am home in case it rains during the night. One never knows with the Melbourne weather! Unfortunately though on many occasions they have been caught outside at night in all sorts of weather. 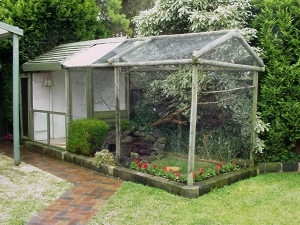 And that is our garden aviary that provides hours of relaxing enjoyment!